There's nothing more inspiring to me than a Call Story from one of my contests. Doug was part of Sun versus Snow 2017. I remember his entry was very unique. A corporate gunslinger trying to pay off her student debt. He just recently announced his book deal. Congrats, Doug! But here is his story in his own words. Many years ago I rode a non-competitive bicycling event where the objective was to complete a 600 kilometer course in 40 hours or less. That ride and related distance events, called brevets, turned out to be surprisingly good preparation to write a novel, secure representation for it, and sell it to a publisher. The first carryover lesson is the obvious one: persistence. The successful brevet rider keeps the pedals turning, no matter what. You keep going through the stuff you were ready for, like cold mist, and the stuff you weren't, like going over the handlebars into a poorly-marked construction site in the dark. As a writer, same deal. Keep turning out the words, keep turning out the queries, no matter what. Keep going through the inevitable barrage of rejection. In my case, it was 59 carefully-personalized queries rejected before connecting with my agent via the Sun vs Snow contest, followed by a dozen publisher rejections before securing a contract. The related lesson is that there is no real end. Finish the 200K brevet course? Two weeks later, the 300K beckons. Then the 400K and the 600K. Complete that series, and you're eligible for one of the 1,200K events. After that? Next season. In writing, the struggle to write the book isn't the end; more like "the end of the beginning." It's followed by rounds of editing, work on the query letter and queries, also edited many times over, and then the search for an agent or editor. It's tempting to view securing representation as an end, because it's such a daunting task. But of course, it isn't. In my case, I knew I had some serious work to do when I signed with my agent. Despite nearly four years of effort that included terrific support from my wife and excellent feedback from workshop partners and beta readers, I knew the book could be better. I also knew I needed focused professional input to get there. When I signed, I anticipated my agent would provide that input, and she came through in the best possible way. I did not anticipate it would take two major rewrites and ten months. I also failed to anticipate that the extensively sweated over, massively-revised manuscript would be accepted by Harper Voyager contingent on another substantial rewrite, but that's what happened. So, I'm working on that, heading for a due date in 2019 and publication the following year. Which brings me to the final carryover lesson: you're in this alone, except of course you're not. During a brevet, the rules stress that a rider must be "self sufficient" between checkpoints. Like most claims to self sufficiency, this is somewhere between a gross exaggeration and an outright lie. On the road, riders share everything from Gatorade to air pumps, and at the check points, friends and family members furnish what's needed: encouragement, shoulder massages, even turkey sandwiches. As a writer, it's true that only you can put your hands on the keyboard and face the empty page. However, I don't think you'll keep it up very long without a contingent of cheerleaders, critique partners, beta readers, and fellow writers to share the journey. In my case, I know I couldn't have produced my initial drafts without the help of my wife, Catherine, who read everything and offered amazing feedback. The relationships formed in the Paradise ICON Writer's Group and the Dire Turtles Online Crit Group have been vital. I definitely could not have created a credible query without the help of my Sun vs Snow mentor, Michael Mammay, and I wouldn't have met him without the generosity of Michelle and Amy in putting the contest together in the first place. On top of everything else, there's the contribution of my agent, Danielle Burby of the Nelson Literary Agency, who pushed me to the next level and sold the resulting manuscript. As I write this, I'm taking the first steps in starting a new working partnership with David Pomerico and Harper Voyager. This is a pretty big crowd for a solitary occupation, and both an inspiration and a reminder to do my bit when I'm part of somebody else's crowd. So, stick with it, stick it out, and stick together--lessons for both long distance cycling and longform writing. I hope to see you around. 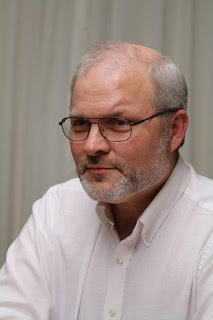 Doug Engstrom has been a farmer's son, a US Air Force officer, a technical writer, a computer support specialist and a business analyst, as well as being a writer of speculative fiction. His novel, Corporate Gunslinger, will be published by Harper Voyager in 2020. He lives near Des Moines, Iowa with his wife, Catherine Engstrom.